“The Shooting” (1966) and “Ride In the Whirlwind” (1966) have always been joined at the existential hip for obvious reasons. 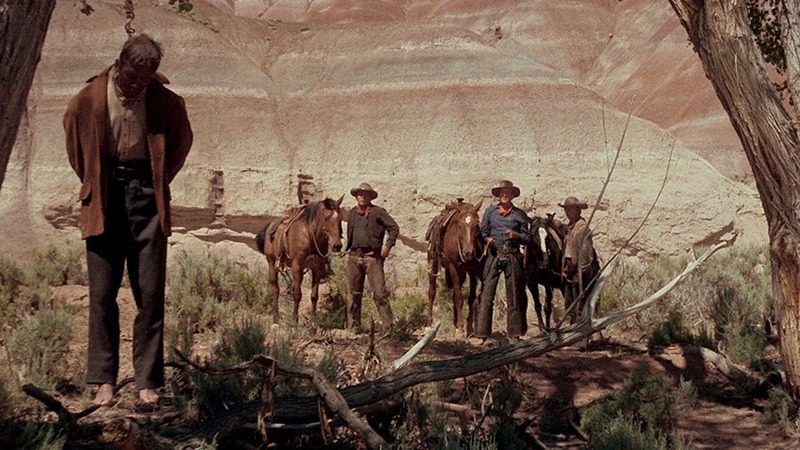 Funded by Roger Corman and directed by Monte Hellman, the low budget Westerns were shot so close together they even share some of the same horses and were both filmed near Kanab, Utah, a hardscrabble moonscape of sterile rock and foot-high, sickly-green sagebrush. It seems only appropriate that a portion of the area now forms the bottom of Lake Powell as the people of both films could only fully belong to locations that aren't quite there. Though they'll always be connected, each of Hellman's Westerns offers its distinct pleasures. “The Shooting” is, at its core, a documentary about Warren Oates being awesome. The best inventions seem so obvious you can't imagine nobody had thought of them before, and this movie will leave you flabbergasted that Hellman was the first person who had thought to make Oates a leading man. Has the camera ever loved a face so much? Oates imbues the role of cowhand Willett Gashade with a presence so palpably dense you can almost imagine he's the only person in the film who really exists and has simply dreamed everyone else (maybe the audience too) into existence just to keep himself occupied. “Everyone else” in this case includes only a handful of other people, one of whom (B.J. Merholz as Leland Drum) is dead before the story begins. Among the living (maybe?) are Gashade's twitchy sidekick Coley (Will Hutchins) and an unnamed woman (Millie Perkins) who simply materializes on a distant ridge before hiring Gashade and Coley to... well, we don't really know. 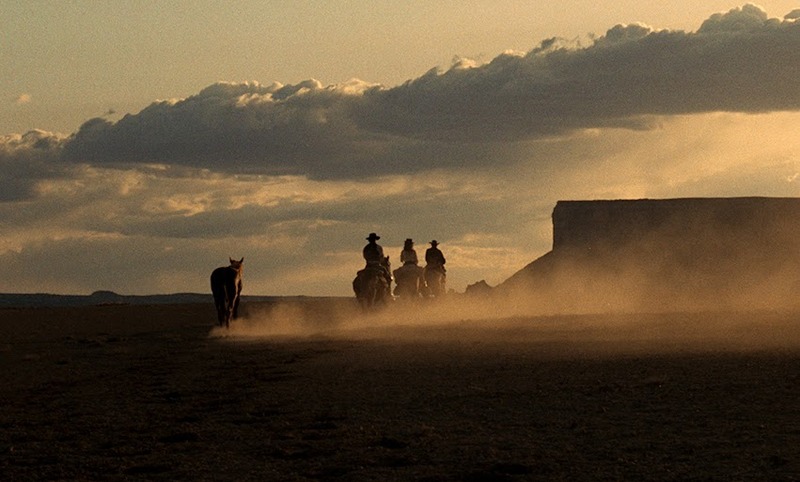 Mostly to pick a perilous path through an unpopulated desert in pursuit of whatever the woman is pursuing and to meet up with a toothy wolf of a hired gun named Billy Spear. Spear is introduced with a close-up of his eyes which must have seemed evocative and anonymous at the time, but which are now instantly recognizable as Jack Nicholson who also co-produced both films with Hellman. The script by Carole Eastman (writing as Adrien Joyce and soon to be Oscar-nominated for “Five Easy Pieces”) is peppered with terse dialogue like Gashade's “My mind's all unsatisfied with it.” The essence of the project is revealed in a typically efficient exchange: Gashade says, “I don't see no point in it” to which the woman replies, “There isn't any.” Beckett rides again! If the shooting of “The Shooting” was rushed there's no visual evidence aside from the occasional and irrelevant lapse in continuity editing; this film, like its twin, features consistently gorgeous cinematography by Gregory Sandor. The camera retreats to a high, distant vantage point for long panoramic shots that situate the lonely riders as shimmering dots who almost disappear into the landscape, then pulls in for meticulously composed close-ups that seize the opportunity to explore that pensive sculpture that is Oates' face which critic Kim Morgan so aptly describes as “handsome and sometimes ugly... a face with history and innocence.” In one of the most memorable shots, Oates squats down in the foreground and scans the horizon for the trouble he knows is brewing while Hutchins fiddles around with a bag of flour in the background; a gunshot sends Hutchins into a panicked run for cover with a trail of flour billowing behind him. Oates hardly budges because, well, he's Warren Oates. “Ride in the Whirlwind” is, alas, an Oates-less oater, but compensates as best as possible by dropping us right into the middle of the no-nonsense action. I may not be qualified to declare anything the “best” of all-time but I can say the film begins with the most convincing stagecoach robbery I've ever seen. A group of men, not yet individuated, mill about nervously as they prepare to swoop in for the score. Shootings occur at a clinical distance that renders them as confusing as they must feel in the dusty swirl of action. It's all over quickly though nowhere close to cleanly. “Whirlwind” is slightly greener than “The Shooting” and teeming with more human life. And death. The film switches from the robbers to three riders who happen upon a man hanging from a tree. These cowhands may be rugged but they don't dismiss the grisly sight, savvy enough to know that there but for the grace of a disinterested God go they. Vern (Cameron Mitchell) is the veteran leader of this strictly working class bunch, Wes (Nicholson again) the younger man who looks up to him, with the quiet Otis (writer Tom Filer in his only film role) rounding out the pack. Seeking shelter for the night, they unwittingly stumble upon the thieves' hideout, a point at which “Whirlwind” further distinguishes itself from more formulaic genre entries. The film (with a script also by Nicholson) stages the “duel” between the two groups as a volley of anxious glances, awkward postures and forced politeness (everyone is "much obliged”). They manage to co-exist but quickly huddle up separately to share their fears, and the “bad” guys (led by Harry Dean Stanton without the Harry in his credit) are just as worried as the “good” guys. These are predators who know how easy it is to become prey. This is the kind of world (maybe not unlike ours) where the innocent can be forced by circumstance to become the guilty and where the plainly guilty can still be victims of summary justice. It's certainly not the kind of world with muscular heroes or righteous lawmen, just survivors and the dead. I always remembered “The Shooting” as the better of the two, perhaps because of its more abstract, hallucinatory qualities (I've avoided describing the doozy of an ending just for your sake, dear reader), but revisiting the pair for the first time in a half-dozen years I might give the nod to “Whirlwind” now. There's really no way to lose with either. Nicholson is marvelous, surprisingly vulnerable and looking even younger than 28 in one of his earlier major roles. The landscape is once again a character of its own, especially the box canyon that hems in our unlucky fugitives and reminds them that neither the terrain nor its designer will be providing them any refuge. Both films failed to make any kind of box office impact on their initial release in 1966 but would eventually find a second life, in part because of Nicholson's growing reputation but also with fans drawn to Hellman's work through masterpieces like “Two-Lane Blacktop” (1971), one of several Hellman-Oates collaborations which also included the marvelous “Cockfighter” (1974) and “China 9, Liberty 37” (1978). Hellman's entry in “The Film Snob's Dictionary” pokes fun at the considerable art-house reputation his low-budget genre films have earned, but the appeal should be obvious (the relatively pedestrian IMDB user ratings for both films fall under the category of “This is why we can't have nice things.”) Flawlessly shot and edited, built around focused, concrete scripts, these are the kinds of movies that should be held up as examples for aspiring filmmakers. Of course, not every film student has access to a Warren Oates or a Jack Nicholson or the talent of a Monte Hellman, but let's not quibble over details. Both films, included on the same single Blu-ray disc, are presented in their original 1.85:1 aspect ratios. These new 4K digital transfers (supervised by Monte Hellman) do a fine job of capturing detail in the fairly uniform color schemes. “The Shooting” is a whole mess of dirt and dirt-colored rocks, the same hue filling the entire frame sometimes. The all-earth tone scheme makes flesh tones really stand out and the image detail is particularly strong in close-ups. 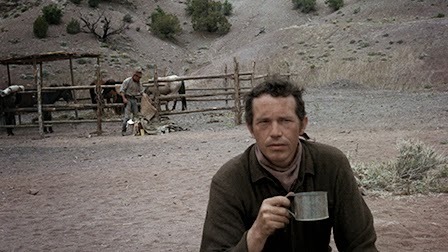 Did I mention that the camera loves Warren Oates' face? So does high-def. Both films have linear PCM mono audio tracks. The lossless audio is as crisp as usual from Criterion; those old recycled ricochets never sounded so distinct. Optional English subtitles support the English audio and might be needed for time to with the idiomatic dialogue. Though Criterion has fit two features onto a single disc, they've still found room to include a good deal of extras without skimping on audiovisual quality. Both films are accompanied by new commentary track by Monte Hellman and film historians Bill Krohn and Blake Lucas and Monte Hellman's dog Kona. Krohn and Lucas offer some genre analysis but Hellman's stories of the film's production and his thought process really power the commentaries. One of the best pieces on the disc is “An American Original” (14 min. ), an appreciation of Warren Oates written and narrated by critic Kim Morgan. It's a great piece, the text of which I briefly quoted above and which you can also find at her blog Sunset Gun. I think she might be a fan of Mr. Oates. The fold-out insert booklet includes an excellent essay by critic Michael Atkinson. 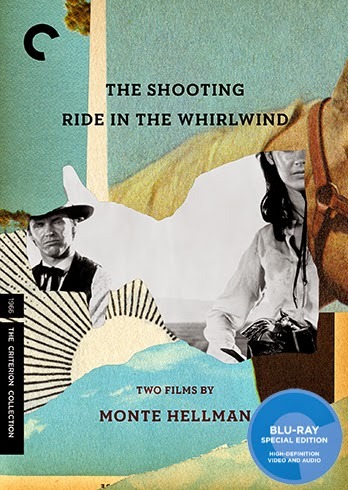 “The Shooting” and “Ride In the Whirlwind” were mostly seen on shoddy TV broadcasts for years and a few undistinguished DVD releases years ago only improved the situation marginally. These high-def restored transfers present the films in a state at least approaching their original luster and it's unlikely many people have ever seen them looking so good, maybe not even Mr. Hellman at least in quite some time. The films work alone and even better as a pair. Each deserves consideration in the pantheon of great Westerns and this disc should provide ample evidence to back up that claim.